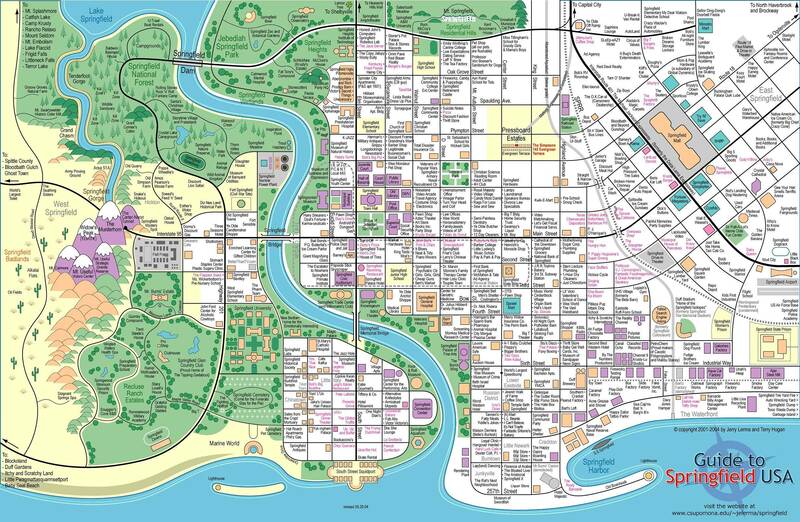 The map above shows the town of Springfield from the Simpsons. It was created by Jerry Lerma and Terry Hogan (with the link to their website sadly no longer working) and states it was last revised on May 26th 2004. This suggests the map is only accurate up to the end of season 15 (the show is currently on season 27). What’s your favourite Simpsons location? Leave your thoughts below. Also please help us by sharing this map. It is important to keep in mind that sprinfield is a newsprint town (I think that’s the correct term but maybe not). This means that it is changed to fit the status of a particular episode. But, this map is still a good stock rerepresentation of the town.